Here are some weddings that I have worked in and around Dallas proper. Chad and Tara rang in the New Year by getting married! It was a wonderful way to celebrate. Their friends and family partied well into 2012 and helped me start this wonderful year off right. So…Happy First Anniversary Mr. & Mrs Davis! I hope life in Singapore is treating you well. Here is a highlight of the pictures from their beautiful ceremony and reception at the Joule Hotel in downtown Dallas. Photos are courtesy of Chris at Ivey Photography. To see more pictures from this wedding check out the Ivey Photography blog and also check out the post of Tara’s bridals. Notice the uplights are subtle but add a definite splash of color. Both of Tara’s parents walked her down the aisle. Look how stunning Tara looks in this candid. Different angle. Different setting on the camera and the uplights create a completely different photo. Shameless plug for the Joule but also a great shot of the energy downtown on NYE. There was a ton of energy downtown already because of NYE. We added purple uplighting to the ballroom. Chad’s best friend and co-best man, David, sang a first dance that he and Chad had written together. Talk about having everyone’s undivided attention to each word. I am glad Chris captured this photo because there are not words to describe the emotions and love that go with your new husband writing a song for you. The parent dances were a little emotional because Chad and Tara moved to Singapore right after the wedding for Chad’s job. The Texas Tech Betas in attendance made sure that Chad experienced passing the ‘loving cup’ even if they had to improvise with a bottle of champagne. And the crowd was ready. Full shot of the dance floor. Tara and Chad owned the dance floor. We did sparklers at midnight in lieu of a send off, because this group wanted to party until LATE into the night. Amy & Ryan celebrated their entire wedding at the Old Red Courthouse in downtown Dallas. My team was there to provide DJ, ceremony sound, uplighting, custom monogram, and photobooth. Here is a teaser video from Dulock Productions of the evening. I cannot wait to share the rest of the films that the Dulock team is working on. One more from Ammi and Peter’s wedding (atleast until the photographer and videographer post some of their stuff). Ammi’s family is originally from Korea so Gangnam Style was not just an internet sensation, but a must play at her wedding. Their friends and family KNEW the dance. Here is a short snippet of the fun we had at CityPlace. 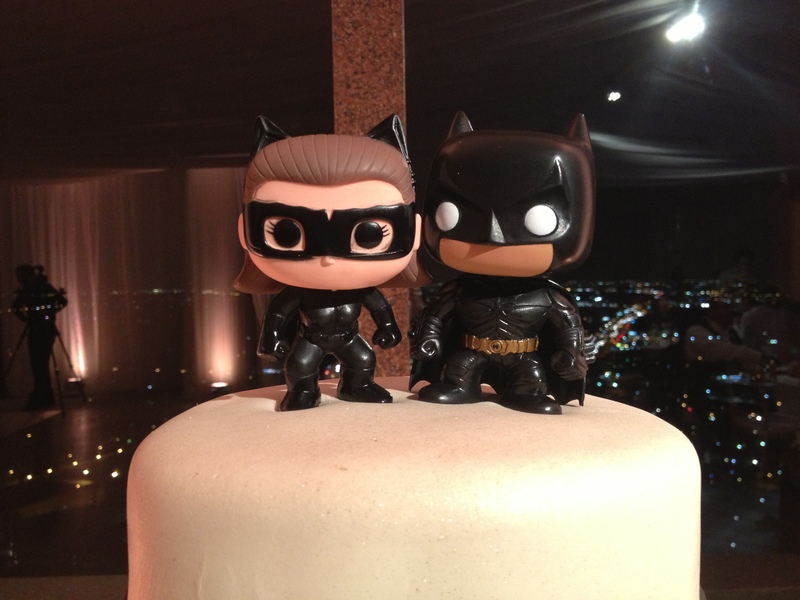 Who says you cannot have Catwoman and Batman as your cake toppers? Not Ammi and Peter! Here was the cake from Saturday’s wedding at CityPlace Dallas. You can see a little of the view in the background. Yesterday I posted photos from Courtney and Jacob’s reception. If you missed them, be sure to check out that post. In today’s post I have the privilege to share the highlight video that BJ Roman, at Roman Video Productions, put together to commemorate the day. Sweet Pea Events planned this event with Courtney to perfection. Courtney and Jacob from Roman Video Productions on Vimeo. I cannot believe it has been a year since we were celebrating this wedding at the Crescent Hotel. We got to work with so many great vendors on this wedding. Kelly and Meaghan at Sweet Pea Events handled all of the planning. Di Fiori had phenominal floral designs. Roman Video Productions documented the whole thing on film. Glenn Roush provided entertainment and lighting. Averi Blackmon Photography graciously provided the photos showcased below. Courtney and Jacob had a choreographed first dance. A celebratory kiss from a job well done! Di Fiori provided all of the floral. Jacob’s cake was an Ironman logo (the race not Robert Downey Jr. character), because Jacob is an avid runner and has competed in Ironman competitions. In fact, he ran a 5k the morning of his wedding. The chefs at the Crescent put together this lovely cake. This is a perfect example of why I am so particular about toasting. You can have a picture with the bride, groom, and person giving a toast (bestman in this photo) perfectly framed. The guests can see the couple, but the toaster can look at the bride & groom to eliminate the nerves of facing the crowd. All smiles for the father-daughter dance. I love both of the smiles on their faces. The toss portion of the reception does not have to be cheesy to be fun! Courtney and her family had prepared me that their guests were coming to party. Jacob did not show any signs of running a 5k that morning. Apparently, that is just a warm up for an Ironman. Everyone needed to catch their breath. They finished the night with a private last dance together. Then it was time for a flower petal send off. Jen and I love how the classic Rolls and Courtney’s cover up make this photo look like it is from a different era. The getaway car was a classic Rolls Royce. Daniel and Angela were married and celebrated their wedding ceremony and reception on October 7th at the Trinity Audubon Center in Dallas. We worked with Premiere Photobooth and McGowan Images on this gorgeous wedding. The videographer on this A-Team, J Christopher Films shared this incredible highlight video. Angela+Daniel from Jeffery Coombes on Vimeo. Yesterday I posted photos from Daniel and Angela’s wedding ceremony. They were married on October 7th and hosted their ceremony and reception at the Trinity River Audubon Center in Dallas. Special thanks to Chelsea and Mac McGowan at McGowan Images for sharing these gorgeous photos. We also worked with J Christopher Films on this wedding and will post the teaser video tomorrow. The event space has a view of the wetlands and reservoir outside. Trinity River Audubon Center at night. Once the sun sets, a little bit of uplighting makes the room pop. The bestman toast was a riot. The father-daughter dance was a loving embrace. Then it was time to cut loose. Pictures are worth atleast a thousand words. The ladies wanted the bouquet! Flutterfetti may confuse your HD TV whenever it comes down on the Super Bowl Champions, but it does not confuse a photographers lens. To see more photos from this reception, check out the McGowan Images blog post. Daniel and Angela were married in October at the Trinity River Audubon Center in Dallas. The weather was perfect for an outdoor ceremony. The wind had been acting up at points during the day, but it died down just in time for the prelude. Special thanks to Chelsea and Mac McGowan at McGowan Images for sharing these gorgeous photos. The weather was absolutely beautiful. Angela’s parents walking her down the aisle. The ceremony was in the round. Beautiful shot from Chelsea and Mac. The sun was setting just past the reservoir behind the trees. To see more photos from Angela & Daniel’s ceremony, check out the McGowan Images Blog. Earlier we posted pictures from Chad and Tara’s New Years Eve wedding ceremony at the gallery connected to the Joule Hotel in downtown Dallas. Afterwards, they came back to the hotel ballroom to celebrate their love and ring in 2012. This was the last wedding at the Joule before the space was closed for a major renovation that will see the hotel grow its meeting space significantly and add some spaces that are sure to change the landscape of Dallas weddings. Chris at Ivey Photography was kind enough to share some images of the evening that really capture how fun, energetic, and beautiful this wedding was from top to bottom. To see more photos from this wedding check out the Ivey Photography blog. Chad and Tara were married on New Years Eve at the art gallery connected to the Joule Hotel in downtown Dallas. For her ceremony, we provided completely hidden sound and some well placed lighting to make the space really pop. For ceremonies, it is amazing what just a couple of well placed uplights will add for the photographer, videographer, and guests. Here are a few images from Chris at Ivey Photography. Chris and his team were so inconspicuous in a space that is not small, but was packed with friends and family who were there to celebrate. To see more photos from this wedding check out the Ivey Photography blog or if you want to see Tara’s bridals check out this post. I had the privilege of providing entertainment and uplighting for Allie and Richard’s wedding reception at the Rosewood Crescent Club Ballroom. Hannah from DFW Events worked with Allie and her mother Tilly to put together an unforgettable night. Special thanks to Michelle Peyronet from Peyronet Photography for sharing these amazing pictures. Russ & Allie’s share a special father-daughter dance. Allie & Richard made these fun custom table numbers. RRichard teaches kindergarten in Kansas City. The kids in his class wrote notes for him and Allie. I love the champagne/amber uplighting. The Crescent Club chefs created this beautiful cake. Closer view of the cake topper. Richard dancing with his mother, Sharlan. Jenn and Jordan hosted their reception in the pavilion of the beautiful Four Seasons Resort & Spa of Dallas. Special thanks to Katy Taylor and all of the Four Seasons staff for being such amazing hosts . Katie Lamb and Jenn knew each other from Baylor, so Katie made the trip up from Houston. To see more pics from this wedding, check out Katie’s blog. Jordan and Jenn picked out custom songs for each couple, and the wedding party did not disappoint. They had a blast and got everyone laughing (and cheering). The room was electric when we brought the new Mr. & Mrs. Adams into the room. But having watched their best friends ham it up during their introductions, they were not going to be outdone on their wedding day! But then the groomsmen (specifically Jordan’s brothers) initiated a double dutch jump rope and we were back to having fun and never really stopped! The purple uplighting really complimented the room. After we cut cakes, it was time for Jordan and his mom to open the dance floor with their dance. And the crowd did not disappoint. They packed the dance floor early, often, and stayed late. Jordan and Jenn lived on the dance floor. Sparkler send off to finish the night. Thank you Katie Lamb Photography! Jenn and Jordan were married just before sunset on October 21st at the beautiful Four Seasons Resort & Spa of Dallas. Their ceremony was right off the 16th hole and the weather could not have been more perfect. 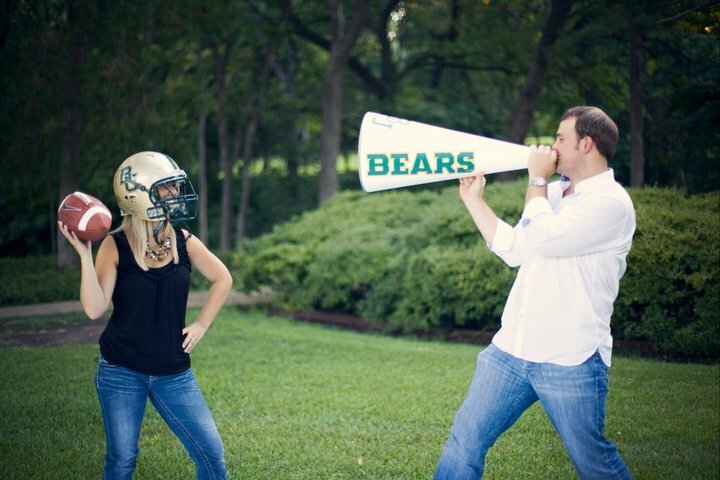 Katie Lamb made the trip up from Houston and we had a Baylor football player marrying a Baylor cheerleader with a Baylor photographer and Baylor DJ. Sic Em! I loved this couple because they were always ready to have fun. Wait until you see the reception photos. Jenn & Jordan's pug Daizee was also in attendance. We were on a golf course. Jordan and the guys getting their first view of Jenn. Love the look of excitement. Jenn's brother Chase walked her down the aisle. Jordan is fist bumping down the aisle. 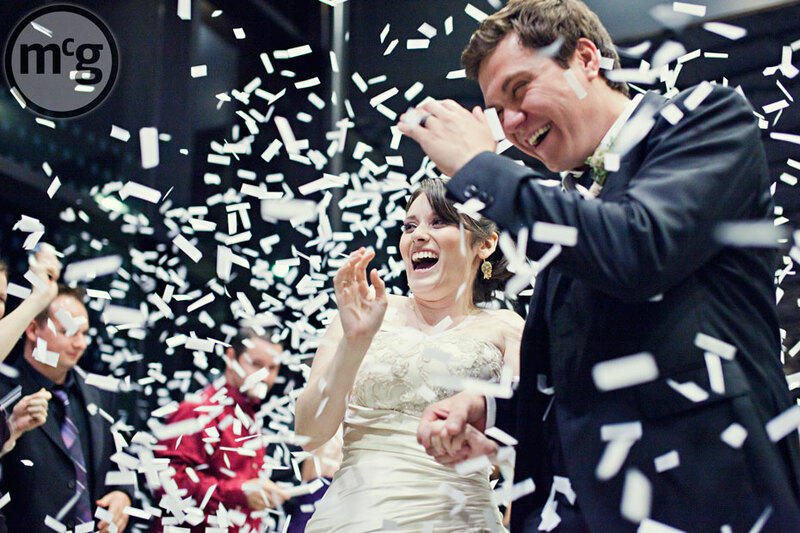 All grooms should be this excited about marrying their best friend. This is the wedding party. They have a lot of friends. They are happier than most people are when that close to the water and sand trip. Beautiful couple. Kuddos Katie Lamb for the stunning pics. To see more of Katie Lamb’s photos from this wedding, check out her blog. Ginger and Rick hosted their wedding ceremony and reception at the beautiful Hotel ZaZa. I knew this was going to be a fun wedding from our first phone conversation when Rick told me that he and Ginger wanted a party and to have fun, new music for dancing. The ZaZa ballroom already has lighting on one side, so me and my team went in and matched the color to give the room a full wash. Thanks to Marc Roberts Videography for this amazing highlight video. Ginger & Rick from Marc Roberts on Vimeo.